Point source pollution is contamination that enters the environment through any discernible, confined, and discrete conveyance, such as a smokestack, pipe, ditch, tunnel, or conduit. Point source pollution remains a major cause of pollution to both air and water. Point sources are differentiated from non-point sources, which are those that spread out over a large area and have no specific outlet or discharge point. 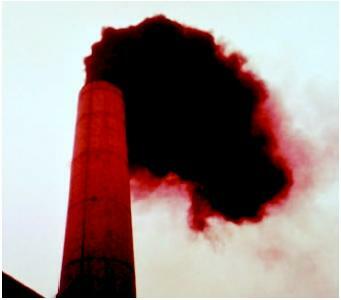 Point source pollution in the United States is regulated by the Environmental Protection Agency (EPA). Point sources of water pollution include municipal sewage treatment plant discharges and industrial plant discharges. Municipal sewage treatment plant point sources can contribute pollution in the form of oxygen-depleting nutrients and in the form of pathogens that cause serious health hazards in drinking water and swimming areas. Industrial point sources can contribute pollution in the form of toxic chemicals and heavy metals. Examples of non-point source water pollution include agricultural and urban runoff, and runoff from mining, and construction sites. The Clean Water Act (CWA), passed by Congress in 1972, provides the basic structure for regulating the discharge of pollutants from point sources to waters of the United States. The CWA gives the EPA the authority to establish effluent limits. Effluent is the outflow from a municipal or industrial treatment plant. The CWA also requires the acquisition of a National Pollution Discharge Elimination System (NPDES) permit prior to the discharge of pollutants. States may be authorized to implement CWA programs, but the EPA retains oversight responsibilities. The EPA manages effluent limits for point sources in two ways: through technology-based controls and through water quality-based controls. Industry-wide effluent limits are established on a technology basis. These are minimum standards based on available treatment technology and pollution prevention measures. Effluent limits are also established on a water-quality basis. Water quality-based criteria are scientifically defensible standards that ensure protection of designated uses of a receiving water. Either standard may be superceded by the more stringent standard, as determined by the control authority. Municipal point sources are the result of community sewage treatment systems. At the sewage treatment plant, wastewater is treated to remove solid and organic matter, disinfected to kill bacteria and viruses, and then often discharged to a surface water. Not all solids and organic matter are removed during treatment, resulting in degraded receiving water quality, due to a reduction in dissolved oxygen . Nutrients such as phosphorus that are not removed during treatment can cause overgrowth of algae and other organisms, also leading to lower dissolved oxygen. Many toxic substances can pass through conventional municipal treatment systems. Improperly treated sewage can be released as a result of upsets to the treatment process or as a result of operator error. During heavy rain, discharges from sewage treatment systems can be a serious problem. In many municipalities, storm-water runoff is combined with municipal sewage in a common system. The increased water volume leads to reduced treatment. Combined sewer overflows occur when water flow exceeds treatment plant capacity, resulting in untreated sewage being discharged directly to rivers, lakes, or the ocean. Industrial point sources are the result of industries using water in their production processes, and then treating the water prior to discharge. Some of the industries requiring process waters include pulp and paper mills, food processors, electronic equipment manufacturers, rare metal manufacturers, textile manufacturers, pharmaceutical manufacturers, forest product producers, leather tanners, and chemical manufacturers. The National Pretreatment Program is charged with controlling the 126 priority pollutants from industries that discharge into sewer systems. These pollutants fall into two categories: metals and toxic organics. The metals include lead, mercury, chromium, and cadmium. The toxic organics include solvents, pesticides, dioxins, and polychlorinated biphenyls (PCBs). Unlike municipal treatment methods, which are similar across the country, industrial treatment methods are industry-specific. For example, electro-plating wastewater may require cyanide removal through oxidization. In general, physical processes may be used to remove solids and biological processes to remove organics. Chemical treatment, such as precipitation and neutralization, is also widely used. The National Water Quality Inventory: 2000 Report is compiled based on the water quality reports required to be submitted to the EPA by states every two years. The report identifies "impaired" waters: water that cannot support its designated use, such as fishing or swimming, due to contamination. According to the report, municipal point sources contributed to 37 percent and industrial discharges contributed to 26 percent of reported water-quality problems in the impaired portion of estuaries. Municipal point sources were the leading cause of contamination in 21 percent of the impaired ocean shorelines, and industrial discharges were the leading cause in 17 percent. Municipal point sources were a leading source of contamination in 10 percent of the impaired river miles and 12 percent of the impaired lake acres . These figures are improved over the percentages recorded in the 1992 Report when municipal point sources were a leading contamination source in 15 percent of the impaired river miles and 21 percent of the impaired lake acres. The NPDES permit program can be credited with achieving significant improvements to the water quality of the United States. Immediately following passage of the CWA, efforts focused mainly on regulating traditional point sources, such as municipal sewage plants and industrial facilities. In the late 1980s, efforts to address "wet weather point sources," such as urban storm sewer systems, began. Currently, there is a greater focus on nonpoint source pollution. The EPA is moving away from a source-by-source and pollutant-by-pollutant approach to a watershed-based approach. A watershed, or "placebased," approach is a process that emphasizes addressing all stressors within a hydrologically defined boundary or drainage basin. Equal emphasis is placed on protecting healthy waters and restoring impaired waters. Point sources of air pollution include stationary sources such as power plants, smelters, industrial and commercial boilers, wood and pulp processors, paper mills, industrial surface coating facilities, refinery and chemical processing operations, and petroleum storage tanks. Examples of nonpoint sources of air pollution include: on-road mobile sources such as cars and trucks; nonroad mobile sources such as construction and recreation equipment engines; and natural sources such as windstorms and fires. Exposure to air pollution is associated with adverse effects on human health including respiratory problems and lung diseases. Air pollution can also significantly affect ecosystems. U.S. EPA. Reproduced by permission. under the CAA. A permit must be obtained for large sources that release pollutants into the air. The permits require information on which pollutants are being released, how much pollutant is released, what steps are being taking to reduce pollution, and plans for monitoring. The EPA has set national air quality standards for six principal air pollutants (also known as criteria pollutants): carbon monoxide (CO), lead (Pb), nitrogen dioxide (NO 2 ), ozone (O 3 ), particulate matter (PM), and sulfur dioxide (SO 2 ). CO, Pb, NO 2 , and SO 2 result from direct emissions from a variety of sources, including point sources. PM can result from direct emissions or can form when emissions and other gases react in the atmosphere. Ozone is not emitted directly, but forms when nitrogen oxides (NO x ) and volatile organic compounds (VOCs) react in the presence of sunlight. The EPA refers to chemicals that cause serious health and environmental impacts as hazardous air pollutants (HAPs) or air toxics. Currently, 189 air toxics have been identified, including chemicals such as benzene, chloroform, and mercury. The EPA tracks air pollution in two ways: (1) emissions form all sources going back thirty years and (2) air quality measured from monitoring stations around the country going back twenty years. The EPA summarizes its most recent evaluations in the report Latest Findings on National Air Quality: 2000 Status and Trends. Since 1970, the total emissions for the six criteria pollutants have been reduced 29 percent. National air quality levels measured at monitoring stations across the country have also shown improvements over the past twenty years for all six criteria pollutants. Over 160 million tons of pollution (from both point sources and non-point sources) are emitted into the air each year in the United States. In 2000 Status and Trends, the EPA reports an increasing focus on tracking and controlling ground-level ozone and fine particles, key components of smog and haze. Progress has been slowest for ground-level ozone. In some regions of the United States, ozone levels have actually increased in the past ten years. The ozone increase correlates to the increase in NO x emissions from power plants and other sources. NO x emissions also contribute to acid rain, haze and particulate matter. Sulfates, formed mainly from coal-fired power plant emissions, are the main source of particles in the eastern United States. The emissions also contribute to the formation of acid rain. The EPA's emissions trading program successfully reduced these air pollutants, resulting in improved visibility in the eastern United States. While point source pollution is declining in the United States, it remains a global environmental concern. According to the UN report Global Environment Outlook 2000, rapid urbanization and industrialization in many developing countries is creating high levels of air and water pollution. SEE ALSO A IR P OLLUTION ; CWA ; CAA ; ; ; D ONORA, P ENNSYLVANIA ; N ATIONAL P OLLUTANT D ISCHARGE E LIMINATION S YSTEM (NPDES) ; N ONPOINT S OURCE P OLLUTION ; T HERMAL P OLLUTION ; T OXIC R ELEASE I NVENTORY ; W ASTEWATER T REATMENT ; W ATER P OLLUTION . U.S. Environmental Protection Agency. (2000). National Water Quality Inventory: 2000 Report. Washington, D.C.: U.S. Government Printing Office. U.S. Environmental Protection Agency, Office of Wastewater Management. (1999). Introduction to the National Pretreatment Program. Washington, D.C.: U.S. Government Printing Office. Vigil, Kenneth M. (1996). Clean Water: The Citizen's Complete Guide to Water Quality and Water Pollution Control. Portland, OR: Columbia Cascade Publishing Company. U.S. Environmental Protection Agency. National Pollutant Discharge Elimination System. Available from http://www.epa.gov/npdes . U.S. Environmental Protection Agency, Office of Science and Technology. Available from http://www.epa.gov/OST . United Nations Environment Programme. Global Environment Outlook 2000. Available from http://www.unep.org/geo2000 .